I have been learning more about the power of South African Marula Oil to help combat the appearance of aging skin. 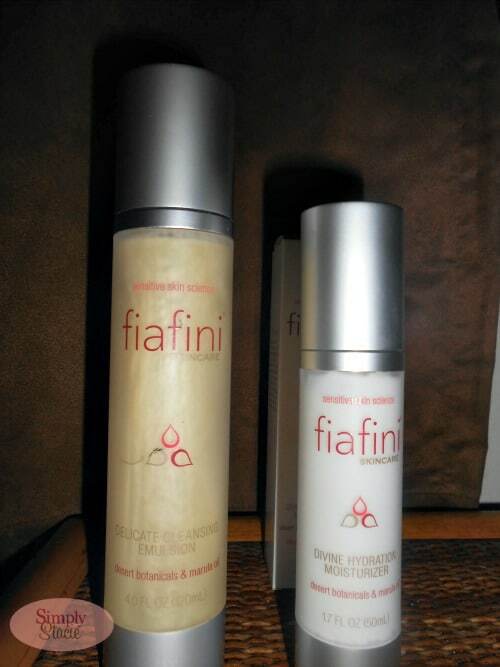 Therefore, I was interested in trying the new skincare line, Fiafini which features Marula Oil. 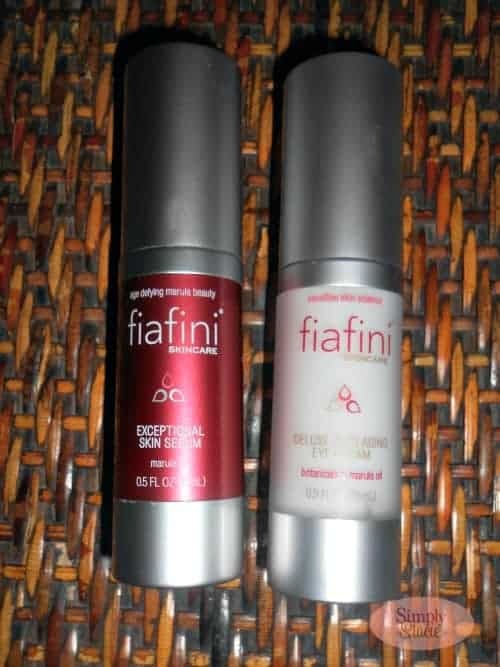 Fiafini Skincare has been clinically proven for use with all skin types and offers anti-aging benefits. I am 40 years old and while I still feel youthful on the inside, my skin is showing the effects of sun damage with furrow lines between my brow and a duller overall complexion. There are four products featured in the Fiafini Skincare collection including the Delicate Cleansing Emulsion (4.0 fl oz. $28), Divine Hydration Moisturizer (1.7 oz. $40), Deluxe Anti-Aging Eye Cream (0.5 fl oz. $38.50) and the Exceptional Skin Serum (.5 oz. $38). I used these products together for a complete skin care regime that I used in the morning and in the evening. The Delicate Cleansing Emulsion is a luxurious cream cleanser that effectively removed makeup left my skin feeling clean and purified with no dryness or taut feeling. It is light and refreshing so perfect for use during the summer. What I like best about using this product is that it does not have any fragrance, alcohol, mineral oil or parabens (it is also vegan friendly with no animal testing). The Exceptional Skin Serum contains powerful ingredients and “potent cell energizers” to offer protection against free radical damage while moisturizing the skin. I have a lot of sun damage and a history of skin cancer so protecting my skin is extremely important to me. This serum applies like silk and absorbs instantly into my skin leaving no heavy residue. I like that it adds extra moisture and gets my skin ready for added moisture. Next, I apply the Divine Hydration Moisturizer to my skin. This product is designed to hydrate and offer soothing relief for aging skin needs such as firming, minimizing wrinkles and restoring elasticity. It calms redness with high quality ingredients like Prickly Pear, Avocado and Evening Primrose extracts along with antioxidants such as Marula Oil and Vitamin E. This rich yet lightweight cream offered my dry skin a much needed “drink” of moisture and left my skin feeling softer and smoother. To finish my skincare regime, I apply a small amount of the Deluxe Anti-Aging Eye Cream which is formulated with Malus Domestica Fruit Cell Culture Extract and botanical extracts to help “rejuvenate, repair and protect” this most delicate area. I have noticed very fine lines aka crow’s feet which I want to tackle and hopefully eliminate early before it becomes more prominent. I like to use the Fiafini Skincare line because it is derived with high quality ingredients without breaking the budget i.e. there is no outrageous pricing. It is also free of unnecessary additives relying instead on Marula Oil, botanicals and antioxidants to cleanse, moisturize and pamper the skin. You are invited to visit Fiafini Skincare to learn more about this brand and to purchase the skincare collection online. It is also available for purchase at OpenSky.com, Dermstore.com, Avery Salon, BeautyBar.com and other fine skin retailers. My wife would like to try the exceptional skin serum. It sounds like a great product for the skin. I’d love to try the deluxe anti-aging eye cream. The exceptional skin serum sounds good. I’d love to try the divine hydration moisturizer. I would love to try the divine hydration moisturizer. Thanks for having this contest. I would like to try the delicate cleansing emulsion.